Star Wars already brings a lot of nostalgia for some of us. But now there’s an 8-bit version of The Last Jedi trailer to really cement all of those ~feels~ in your heart. Yes, someone has recreated the trailer for the upcoming film scene by scene and it’s amazing. Let’s take a look at this amazing feat of nerd-dom. 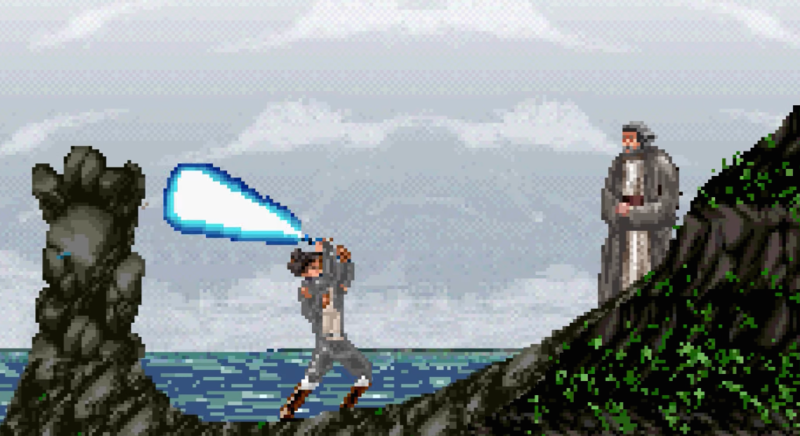 The 8-bit version of the trailer opens the same way as the actual trailer with Rey training with Luke. But the 8-bit lightsabers are pretty cool looking. And they even make the fun sound effects you’d expect from an 8-bit lightsaber. Can we buy one of these somewhere?! And guessing you thought Poe and BB-8 couldn’t physically be any cuter than they are in the actual films but you’d be wrong. These are adorable and 10/10 would play this game! Dibs on being BB-8. Instead of hearing the lines from the trailer, we get to read them in 8-bit form — a reminder of those games we use to play as a kid. Luke’s last line about the fate of the Jedi is still pretty ominous. Eeeek! You can watch the full, awesome 8-bit version of the trailer here — and it’s even Rian Johnson approved.